Imagine you are out hunting in that perfect spring day. 15mph south winds, bright blue bird skies, and the geese are on the move. 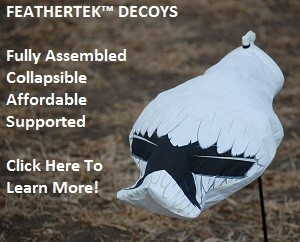 The decoys are set, e-callers are rocking, and the guns are loaded. You hear that favorite sound, a gravelly “squawk”, you look up to geese stacked up one after another in the stratosphere, and you know they are going to do it close. It is going to get messy! Those lead birds get into about 75 yards, the wings go from locked and balled up, to back flapping as fast as they can out of there. All you can think is…who moved. The next flock does the same things. Something is wrong and 9 out of 10 times it is your hide. The geese are seeing you! Fix your hide and it gets messy with dead geese, leave it alone and you blow an opportunity at a big shoot! If there is one thing you should do every morning after you feel your blinds (layout blinds or pit lids) are hidden enough, is hide them some more! Cake your layout blind in mud prior to each season. This will remove any shine. Place blinds close to one another so you have one blob instead of 6, 5-10 feet apart. This is good for safety and communication also. Cover up or hide any shell boxes, gear bags, etc. Place you blind in a low spot or where there is a natural cover change. 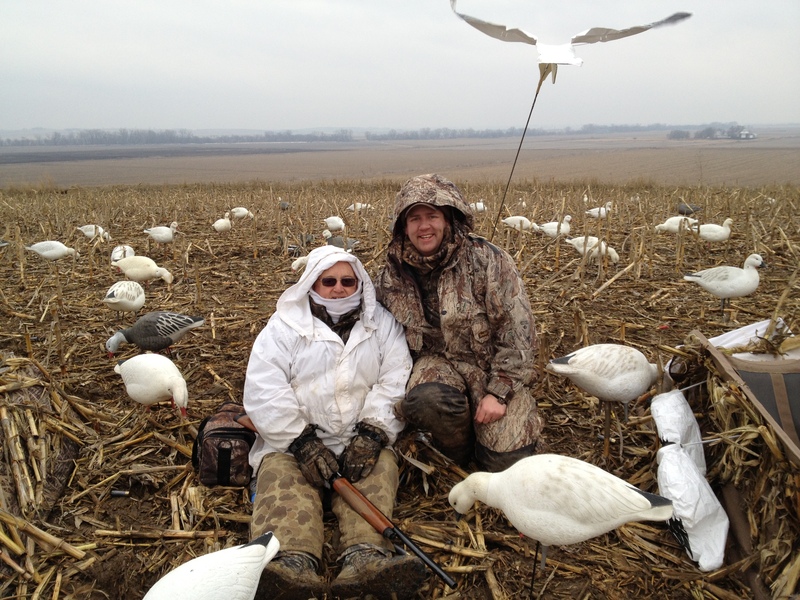 Again… Add more cover to your blind! Comfort is Key for Spring Snows! So what type of blind is best on a spring hunt? 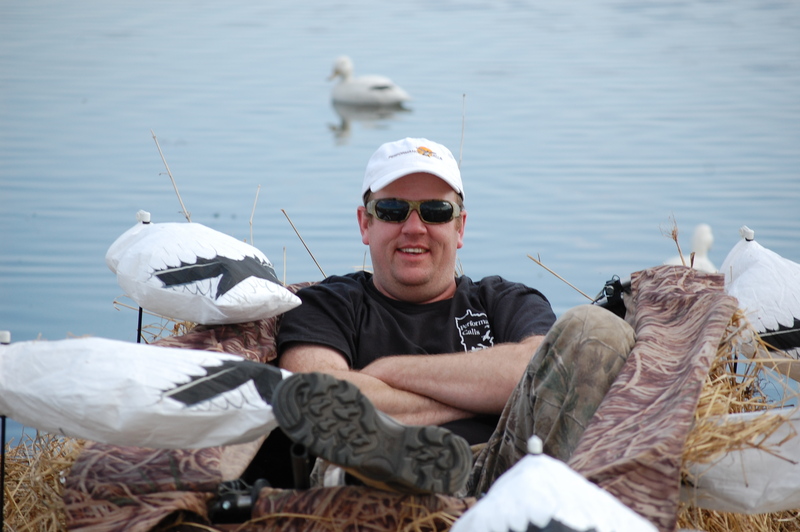 For hunting migrators in the same spot each day…a pit cannot be beat for concealment and comfort. There is nothing like sitting in a pit with nice comfortable chairs. For most hunters, pits are not an option (landowner will not allow them or you chase hot fields daily / weekly) so you will be forced into using a layout blinds or whites. When hunting totally flat fields with no cover (bean fields, fresh cut hay, or barley), whites are my preference over blinds because they can hide hunters better. When wearing whites I prefer some type of elevated backboard or chair. My dad uses a layout chair with whites at all times and he is almost in shooting position from the get go. It is just easier on his back when getting up and into a shooting position than when using a layout blind. One other advantage when hunting in whites is that the geese often do not flare when you pull up on them right away. No big blinds doors popping open! I prefer a full sized layout blind built for comfort anytime there is cover. Typical spring hunts for me are all day affairs, and the comfort of a full framed blind such as a Final Approach Eliminator or something similar is much preferred over a very low profile blind like a power hunter (my blind of choice for Canada geese when it is not cold for its low profile). Snow geese finish into the spread more vertical than Canada geese, so the extra height a full size blind has over a low profile blind does not seem to affect the snow geese. Ideally you want to position your blind such that geese with finish straight over the top of you. On ideal days snow geese will start landing in your spread, but anytime the geese are not finishing completely, you will kill more by firing your first shots when the geese are straight above you. If you are shooting at them at a 45 degree angle, your shot is 1.4 times farther than if you shot at those same geese straight up. Who knew that triangle geometry (http://en.wikipedia.org/wiki/Special_right_triangles#45.E2.80.9345.E2.80.9390_triangle) was useful for snow goose hunting? If you cannot get positioned directly underneath them, and the birds are not finishing 100%, I prefer being off to the side of your kill hole. The geese will be focusing on your blinds less, and you can often get your first shot off without them seeing all the blind doors open when hunting with a few guys. Let the cover dictate if you use blinds or whites. If you choose a blind, remember to get them covered up with natural vegetation. And last but not least….get comfortable. Some of the biggest shoots come during the middle of the day on those migration days we dream about! Hoping you get into a monster tornado of snow this year!